Q.: How many surrealists does it take to make a latte? Aaaaaaaaaaanyhooo. Life is getting more and more surreal. Carl and Miranda have now flown home which is very sad, because Miri loved the snow and it was fun just sharing all these bizarre new experiences with Carl for a change – the vast majority of my travelling has been solo. Also, since we’re intent on actually moving here on a permanent basis, I don’t feel like I can make decisions on jobs or housing or anything without Carl’s input as well. However, moving around the town, chasing things up and house hunting is considerably easier without having to fight Miri into four layers of clothing first, and you can get around quicker without manhandling the pushchair through the snow too! It has also halved my hostel bill. So, sorry baby, but you get to go harrass Granny and Grandad for a week! Carl seemed to survive the flights home with Miri without too much hassle, anyway, which is good because it can’t have been easy! So, this leaves me with another week of trying desperately to find a means of staying here. Ken from Kave Haz is still resting up after knee surgery, so I won’t see him to find out what on earth is going on, until at least tomorrow if not Friday. However, I am too paranoid to rely on him entirely, and so I am scouting around trying to find anything else. Not exactly easy, but Things have that odd way of working out for me, which is where it starts getting surreal. The first night we were in Regina, we went to a restaurant called the Fainting Goat, and got chatting to the very friendly waitress. Turns out, she also works for CBC radio!! And, she was very interested in my coffee adventures and me turning up in Regina for this job, and invited me to come on the show! eep. She was trying to get Ken on with me to talk coffee and Kave Haz, which would be a great bit of publicity for him. But with him laid up after the operation and my job being so unsure, we’ve left it for a while until the situation is more stable. But you never know, I could get my 15 mins of fame in Regina after all! As mentioned before, we’ve made several visits to a place called Roca Jacks, the manager of which, Tamara, is a fellow coffee enthusiast/geek. I am off to meet her tonight to discuss coffee and opportunities and so on, and I am quite excited! She says “you should have no problem finding work here, it’s just the economics of it” – erm, well yes, “the economics” is exactly the problem!! Roca Jacks is a franchise though, so maybe, just maaaaybe there may be some opportunities at the company HQ if not in the actual branch itself. I’ve also handed in CVs to two other coffee shops, both of which were pretty decent, one was a Starschmucks clone, the other is also a restarant and seemed to be filled with earnest sounding yoghurt weavers and woo-merchants. I think I might be too cynical for that place. Carl has also handed in his CV at two companies in Regina, (one was an extremely long walk in the snow to the Old Warehouse District, but at least we got to see far more of the town that way!) and he’s applied for another one online. So, we’ll keep our fingers crossed, but it is encouraging that there are at least some vacancies for jobs he has the skills to do. Having seen Carl and Miri off at the airport, I came back to the hostel and messed around on the internet on ‘Saskjobs’ – and guess what popped up on the screen? A job actually at this hostel!! Both women who work on the desk here are leaving in December, so they are advertising for their jobs. It’s just 20hrs a week, but this is a fun place, very social and if Kave Haz can only offer part time hours now, I could potentially do both and make a full time wage to live off. Again, the owner here was incredibly laid back about it – “yeah just leave us your details and I’ll give you a call in January…” Riiiiiiight. And finally, fellow-hostel-buddy, Lloyd has worked all over Canada, and I was explaining the coffee PhD to him. He suggested looking up Salt Spring Island, because he knew it had a coffee company based there. Salt Spring Island is off Vancouver island, right over the other side of the country, a stunningly beautiful place judging by pictures on Google! Madonna has a house there, apparently, as does Patrick Stewart. Aaaaaaaaaaaaand, Salt Spring Coffee Company are hiring! Just baristas at the moment, but I applied and said I’d be very interested in any other jobs going within the company…. you never know!! So, plenty of things to chase up, and all is not lost. I have a strong feeling that Things Will Work Out Somehow. They always do, even if not in the way I first anticipated. 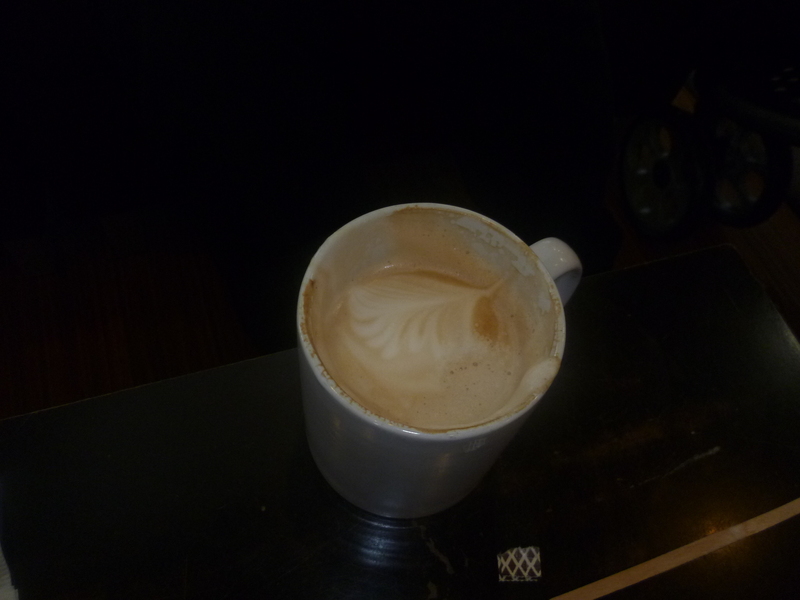 In the mean time, here are some pretty pictures of coffee in Regina. Dollar coins are called Loonies, because they have a bird on them, which is also called a Loonie. But you now get a two-dollar coin too, so they call it a Toonie. Logical, no? It did lead to the bizarre request this morning from a fellow hostel inhabitant wanting coffee out the vending machine: “Have you got 2 loonies for a toonie?” But then two dollar coins are of course, double- loonies, and so therefore, dub-loonies surely? There is quite a lot of beer from Round Here, mainly because there is a lot of grain and wheat and so on. Tonight we tried both Cracked Canoe and a very local one called Bear Brok. Bear Brok was incredibly good! 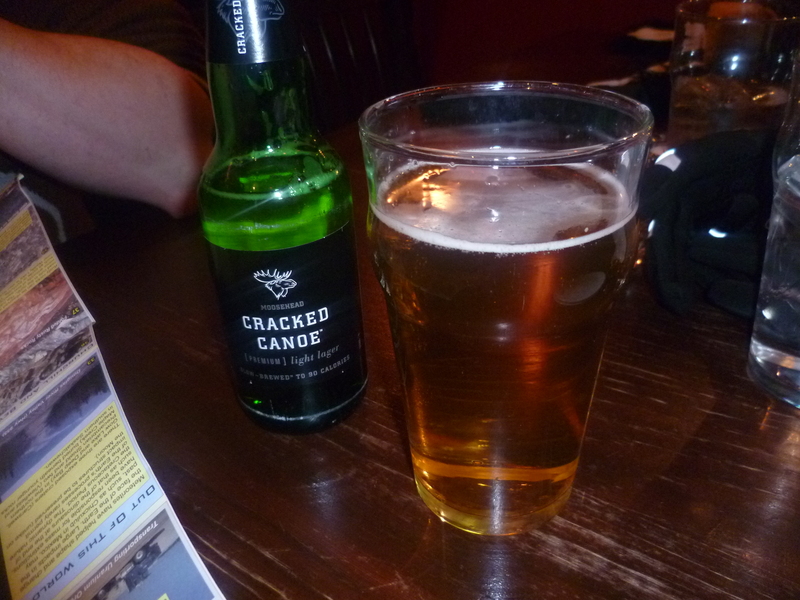 Cracked Canoe though, claimed to be a “light beer”. Only 3.5% alcohol, but presumably as a unique selling point, they’d bothered to do a full nutritional breakdown on the label. Cracked Canoe is only 90 calories a bottle! Wow! And there is 0g of fat! Therefore it must be really healthy and good for you and we should drink loads. the national dish is macaroni and cheese, and comes in cardboard packets for 84 cents. There are no roundabouts anywhere in the city. The city centre has its own Globe Theatre and some Twin Towers. (not very big ones). Traffic lights appear to work on actual clockwork and tick ominously when you press the button to cross. On that note, I cannot get used to 2 lanes of traffic actually stopping for us (without lights) if we stand at the side of the road and look hopeful. “Christianmingle.com” – toe curlingly, cringe-makingly excrutiatingly awful dating site, advertised every 15 minutes on TV, because God is telling single people to make the move today! Family Guy has explicit-content warnings before, after and during the show, and apparantly is not suitable for under-14s. Turgeon Hostel with the most interesting approximation to “working stove” ever encountered. Regina does seem to be Where It’s At at the moment, though what It is remains to be seen. House prices are rocketing, the rental market is moving so fast that the few places we’ve looked at haven’t even been advertised on the internet yet because they’ve not been free long enough to post the ad! The place is booming, and many people we meet are being encouraging saying there is a lot of work going at the moment. Found another apartment this afternoon that would do at least temporarily, though I am not keen on apartments. It is just a case of getting something affordable and comfy until we get ourselves sorted. But in silly news, we went round a Christmas craft fair this morning and I bought a Canadian Christmas spider. yep, a Christmas Spider. Also got Miranda her first ‘toque’. That is, a bobble hat; it has penguins on it! No idea why they are called Toques (pronounced ‘tooook’). It just about stayed on her head, that is until she woke up properly, pulled it off, dropped it and Carl had to retrace his steps for 3 blocks to go and collect it again! Because of this delay, we missed our bus. However, frantic waving and dejected expression accompanied by my Awesome Gorilla Hat meant it actually stopped again to pick us up. 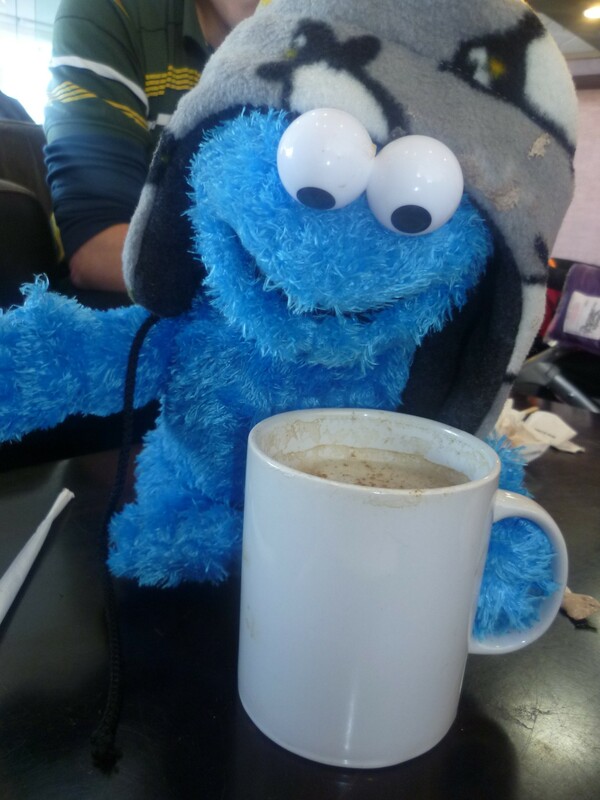 The driver said “I couldn’t not stop for a toque like that.” – this made me Very Happy. Tried a pint of Regina IPA today. Very nice stuff it is too! We had tried to go to a “slow food pub” but they wouldn’t let us in with Miranda, despite us wanting food as well, and it being 3pm. Grrr. It hasn’t stopped snowing all day! The TV said it was -16C today. If it was, then -16C is fairly easy to tolerate. We walked a long way today (trying to push Miri’s buggy through snowdrifts actually made us sweaty!). Regina is still beautiful even in winter, and we all love snow! I am feeling far more positive today, even though we had another set back. The Canadian laid-back-to-the-point-of-being-horizontal attitude is being to grate the nerves. Carl rang the university to say he was in the area, and could he come visit and see about the job he’d applied for there. The secretary was very non-commital and vague on the phone, but did not say the job had already gone. Instead, she just said Carl should stop by whenever he wanted. So we headed down there optimistically, only to find the admin office was closed up for the day, and on enquiry within the department, we discovered a shortlist of applicants for the job had been drawn up, and Carl wasn’t on it. 😦 This is sad, frustrating, and does leave me dependent on Kave Haz for an income. But the uni could just have told Carl over the phone that he hadn’t been selected, surely? Instead of letting us get our hopes up, and more importantly, knowing that would have given us a better idea of our budget when we were house hunting yesterday. 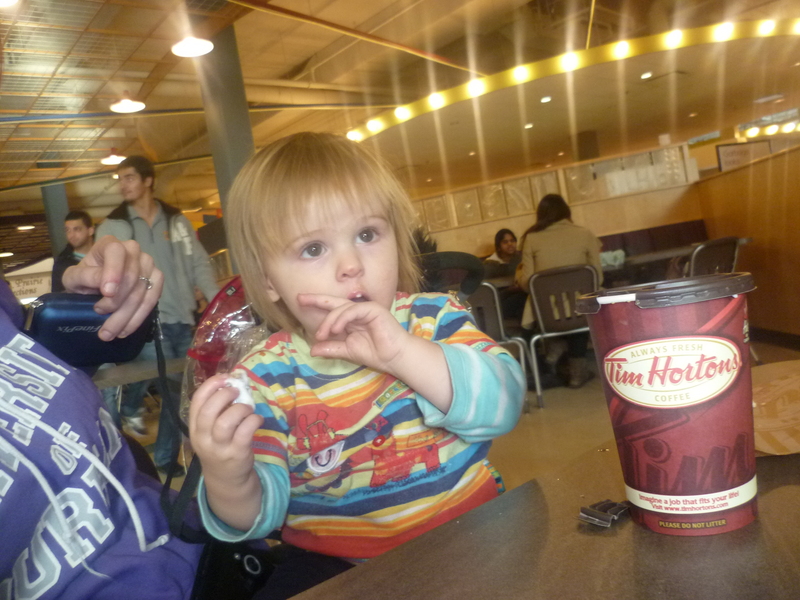 Still, Carl and Miranda had their first Tim Hortons coffee (and numerous doughnuts) in the uni student union. The coffee was truly terrible (it arrived pre-mixed with milk and pre-sweetened without us asking for it – and it tasted like instant coffee. Lucky its so cheap really!). Miranda is now addicted to’ Timbits’ though!! Tim Hortons is weird. It is THE Canadian coffee chain, (despite being bought out by an American company, apparently) there are far, far more of them than there are Starbucks in Regina, and there are leftover cups emblazoned with their logo all over the place. But, it is more of a doughnut emporium than a coffee shop. It is cheap and cheerful and sugary, and everyone loves it. What really surprised Carl though was that all the coffee is ‘drip’ – ie: filtered. Not espresso. 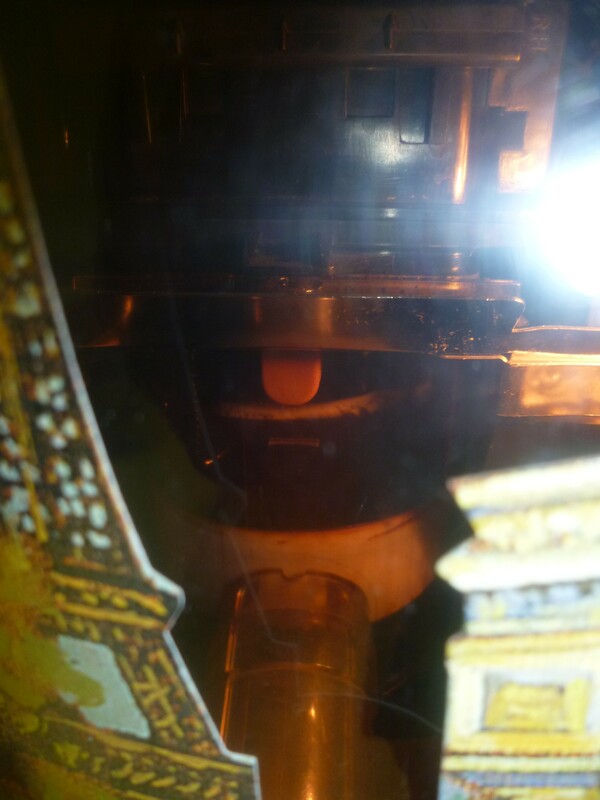 Nothing even attempting espresso, not even a bean to cup machine. Just filter. I wrote about this last time I came out to Regina on my coffee blog but it is still so strange to me that espresso is still a rarity here. Now, normally this would have been enough to tip me over the edge. However, earlier today, I found Roca Jacks. Apparently its a franchise, but there is now only one left in Regina. This is a proper coffee place. Espresso machine, check! And filter as well. 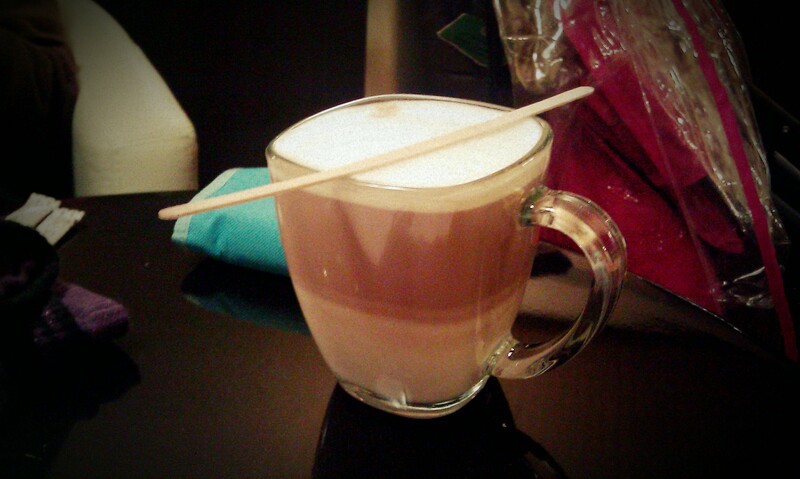 House blend. Fresh coffee to buy in bean form. Aaaaand they roast their own on the premises! YAY! 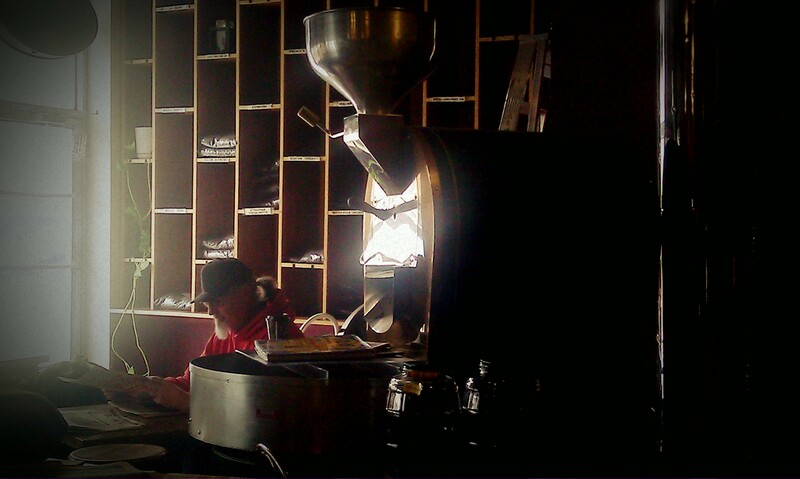 Their espresso was the best I’ve had in Canada so far, dare I say it, better than Kave Haz! 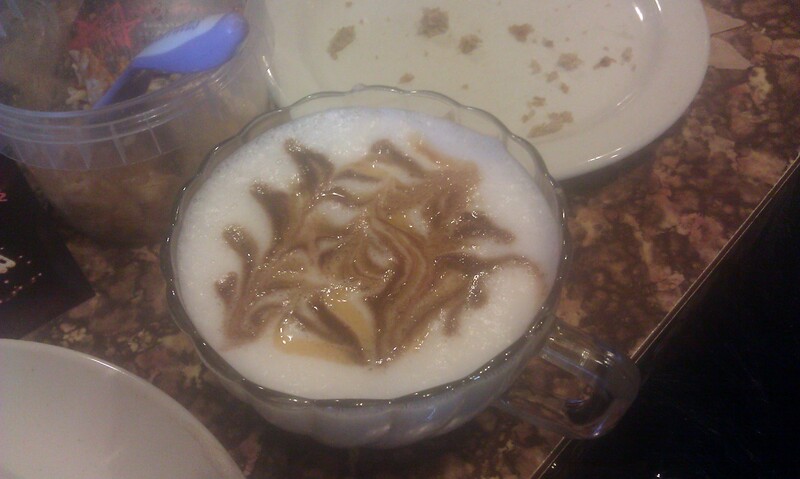 I got talking to the manager, and she and the barista were very into their coffee and seemed very friendly. I left my CV there and the manager said she’d love to talk more, she has some exciting sounding plans…. This all sounds Very Encouraging. Weeee!! Ok, so we are here!! I am still exhausted. The flight was long, but could have been a lot worse. The plane was fairly empty so there was a lot of space for Miranda to bounce around in an Be Miri, and she was loud but otherwise very well behaved. We ended up doing laps of the plane with her patting random sleeping people on the head on her way past! Unfortunately, Regina is 6 hours behind the UK, so travelling west made for a very long day. We arrived at 8.30pm ish Saskatchewan time, but it felt like 2.30am. Miri was still awake, poor baby! And since we arrived, she’s been waking up at 5am thinking it’s mid morning and she ought to be fed! So, maybe it is just tiredness talking. I am feeling a bit overwhelmed but also frustrated. We have been hanging around at Kave Haz, and at first it was really reassuring that is fairly busy in there. There is a new baker and the pastries we tried were excellent. Asyah is holding up well as the barista and only full time member of staff and seems to be enjoying it, which is great. However, Ken barely has time to talk to us, which again is just a sign that the place is doing fairly well. It is also a very good reason for him to get me in as a manager, just so he doesn’t have to do everything himself. However, he is being frustratingly non-committal! He is concerned that he won’t be able to pay me – certainly not the salary he originally stated when I applied for the job. The cafe is just not making enough money. This is VERY worrying, not least because I need the salary – much as I want to move over to Canada and I do think I’d enjoy working at Kave Haz, I cannot live off thin air. But moreover, it is very naive of New Boss to expect the place to be making money in under 4 months. Did he not plan for this? Most new businesses do not break even in the first 6 months, and it is rare for anywhere to make an actual profot within the first year. In a more positive light, he has not said “there is no job for you”, and I do think if that were the case he would have told us before we spent so much on the flights. I don’t think he’s deliberately trying to screw me over, but at the moment it is us taking all the risks, and I am not feeling at all comfortable about this. We looked around four houses this morning, three rentals and one for sale. Any of them would have suited us well – the houses are so *cute* here. The first, and cheapest we saw looked like a little yellow chapel! But the experience really brought home how little we can plan. Only the little yellow house was remotely affordable on the Kave Haz salary, and only then if I do end up working full time there. Our favourite of the four would be perfect if we had two incomes, so definitely possible if Carl had a job too, but that is a big Unknown at the moment. And we would only be able to buy a house if we sell ours back home, OR if Carl’s voluntary redundancy payout comes through. There are so, so many ifs and buts and maybes that I feel completely at sea tonight. I just wish I had a straight answer about Kave Haz for one thing! At least then we could plan accordingly. But I do want this sooooo much. I feel like we’ve come so far already: finding the job in the first place, being offered it, then getting the LMO approved, that godawful wait, all the stress, emotional trauma and financial blackhole of selling my cafe back home… it CANNOT all fall through now! It just can’t! I haven’t got the energy to write properly about the town that has been my home for over seven years, and I do want to write properly and do it justice. I have met some amazing people here and made lifelong friends, I started two businesses here, I’ve learned so much and grown here. This is where Miranda was born. These things will stay with me forever. But at the same time I have had some truly horrible experiences here, most of which I have had a lot of trouble getting over and recovering from. Few things have been easy, and I keep thinking, everything I’ve achieved in the past few years, I’ve achieved despite being in Darlington. It all feels like a constant fight, against a place that saps the spirit and destroys the soul. I have had enough of fighting; I’ve got nothing to prove to anyone here, and so it is time to move on. Those who communicate in grunts and sniffs revel happily in the squalid surroundings. There is a night club called ‘Mardi Gras’ where squaddies from miles around congregate to chase fat single mums and stamp on peoples’ heads. A small town with small minds, I challenge anyone to put ‘darlo’ in a positive light. On a more poignant note, this is one of my favourite songs of all time, which I feel is very appropriate. Our house (2 bed semi, big garden, and SAUNA!) has been on the market since September and so far we have had precisely no one interested in it. Nada. Nuffink. Not a sausage. This is a bit worrying. But then, this is the UK in a recession, worse, it is in the Grim North East and the housing market is basically at a standstill. We got a board outside this morning just in case that helps! (We originally thought that people don’t really drive up and down cul-de-sacs in Darlington looking for places for sale. Most house-hunters are capable of Googling anyway. And if you search the interwebs, you eventually come up with this: http://www.rightmove.co.uk/property-for-sale/property-19882884.html You don’t need a for sale sign for this!!) Anyway, our house – the first one we ever bought and where we have lived for the last seven years – is now up for sale. Shall I miss it? I don’t know. I doubt it. In other news, we are booking flights to go visit Regina again in a fortnight’s time. Carl needs to see the city properly and I need to touch base with New Boss and start seriously house-hunting over there. We’re coming back here for Christmas (otherwise my parents would never forgive us) and I’m looking to move over in the new year, with Carl following with Miranda as soon as he can. Carl applied for a job over there too, and it would make life so, so much easier if he had something to go to as well as me. I don’t think he’d enjoy too long spent being a stay-at-home Dad, he’d be too bored! So far, they’ve contacted us to say they are considering his application and have received his references. He emailed the other day saying my LMO had come through and that he can now get an open work permit, and that we were heading out there and could he come visit? (ie: hinting for an interview). The reply was so laidback as to be a bit unnerving!! “Yes, pop in whenever you can!”. Not sure what to make of that. It does imply, if they don’t mind him visiting, they haven’t appointed anyone else for the position yet. But then, they are hardly clamouring for him to come over, and haven’t mentioned an actual formal interview either. That, coupled with New Boss’s resigned despondancy about his staffing issues, and the THREE MONTH wait for Service Canada to issue the LMO, just confirms the stereotype that Canadians are laidback to the point of being horizontal!!! Now, I almost constantly have a huge amount of stress. I exist in a state of permanent over-caffeination, and for the last year, I have juggled setting up and running my own business full time, writing my PhD thesis and looking after my daughter 24/7 all at the same time. Having now finished the PhD (more or less), I am currently in the process of handing over my business to my partner, selling the house, getting everything organised for emigration, still looking after Miranda all day every day while Carl is at work, and I’ve just voluntarily embarked on National Novel Writing Month – trying to write 50,000 words in 30 days. I actually think the adjustment to laid back, chilled out, unhurried Canadians is going to be pretty hard for me!! On the other hand, a break would really, really do me good.